Our camper isn't going anywhere, anytime soon! 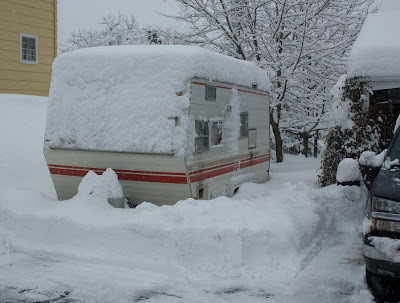 Friday's snowstorm hits upstate NY, and by Saturday our camper is snowbound! The snowstorms that struck Virginia, Maryland and Washington DC missed us here. In fact, we were down to about one inch of snow. It all came back with a vengeance beginning on Thursday. The real snow arrived during the wee hours of Friday morning. Despite assurances to the contrary, the snowfall continued throughout the day Friday and on into Saturday morning. We've used the snow-blower to clear the driveway at least four times, with clean-up by shovel needed each time to remove the heavy oatmeal-colored slush heaped by the road. Meanwhile, our camper sits quietly by my parking spot, next to the garage. We've had very little wind, so the accumulated snow sits nearly undisturbed on the camper's roof. Undrifted snow all around the camper is now almost two feet deep. I'd have to shovel my way to the door to check for snow damage. Everything appears to be safe and snug, anyway. I'm sure the local ski areas are running at capacity this weekend. Over the hill at the high school, there are probably no less than two dozen kids racing down the big hill. The snow continues to fall today, but the temperature hovers above freezing and the sun peeks out now and then. 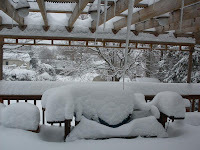 Behind the house, our back deck (my summer "office") lies still under perfectly defined mounds of snow. It's beautiful, but none too hospitable. There's no hint of spring in the air today; but it's not all that far off. Soon enough, our camper will shed it's insular blanket of heavy, wet snow. We'll open the windows and refill the water system, ready for another summer of camping. Not today, though, nor this week. Photo reprints available on request. How about you? Do you any winter camping pictures you'd like to share? 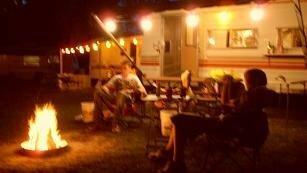 Daytona Beach FLA : While 49 of the 50 states have snow on the ground, the Camping Season begins for all of us who follow professional auto racing. Minutes from now, the Camping World 300 Nationwide Series race sends us the sure roar of spring. 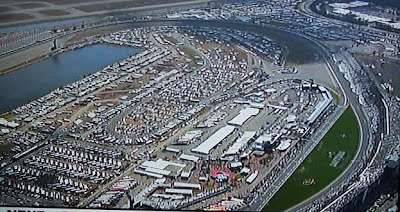 The infield defined by Daytona International Speedway's two and a half-mile track overflows with RVs from all around the country. The stands are packed with NASCAR fanatics. The smell of high-octane racing fuel and hot dogs fills the air. This race runs 300 miles in 120 laps, bringing us the incomparable thunder of 43 stock cars at full throttle. The sounds and smells of Spring! Temps are lower than normal for this famed Florida venue, and the wind may even be a factor. With a cooler track, cars should handle better. We'll see plenty of daring side-by-side racing. Six former Camping World 300 winners join the pack, along with eight previous Nationwide Series champions. Rising star newcomer, GoDaddy's darling Danica Patrick hopes to give 'em a run for their money. From the warm comfort of an upstate NY living room, we'll be watching AFLAC's Carl Edwards (my wife's employer is AFLAC). Edwards finished a video-replay second last year in this race. Also in the spotlight: Dale Earnhardt Jr. (of course! ), Tony Stewart, Kevin Harvick, Kyle Busch, and a slew of Wallaces. The pre-race interviews are done, the anthem sung, the flyover a sleek and stunning symbol of freedom and speed.We humbly thank Camping World for bringing us this splendid harbinger of better weather and camping adventures. "Ladies and gentlemen: Start your ENGINES!" makes it official. 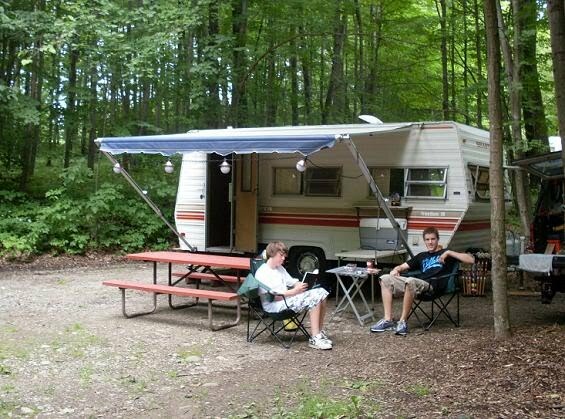 Let's go Racing -- and Camping, too! May the best man -- or woman -- win. Did you attend the race? Love to hear from you if you did!